‘Birds in the Spring’ is a Silly Symphony about a mischievous little bird who encounters a.o. a rattlesnake and some angry bees. This short can be regarded a study in realism, using birds. The realistic birds portrayed here are a far cry from the primitive and cartoony designs of ‘Birds of a Feather‘ from 1931. They fit perfectly in the equally realistic and elaborate backgrounds. The difference between the two shorts shows the enormous and unbelievable growth the Disney studio had made in a mere two years. The snake and the bugs in this cartoon, on the other hand, are not half as good, and fail to evoke any feeling of realism. A cousin of the badly designed snake would appear, however, in ‘Mickey’s Garden‘ (1935). In his autobiography Pinto Colvig reveals that all the chirps, whistles, warbles and tweets in this cartoon are made by two women, Esther Campbell and Marion Darlington. 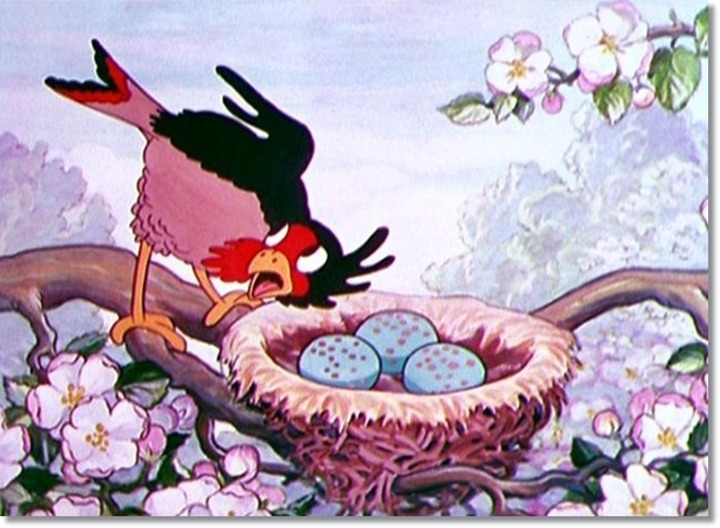 ‘Birds in the Spring’ may have inspired ‘Morning Noon and Night‘ (released October 1933), the first of several Silly Symphony-like cartoons produced by the rival Fleischer studio. Isn’t it alittle bit late to learn to fly when the apples are growing?